Today I got smacked in the face by a jellyfish. It practically flew into my mouth. Don’t worry I’m perfectly fine. I’ll admit to a lot of silent shrieking when it happened. Perhaps even some gagging….How did this happen you might be asking yourself? Read on my friend, read on..
After a couple of days at the dock in Kodiak, Alaska, we are finally underway! My first shift was spent hanging out and watching the scenery as we cruised to the first station. We went through the aptly named Whale Passage where we saw orcas, whales, sea otters, and puffins! It was also the first time we’d seen the sun in two days. 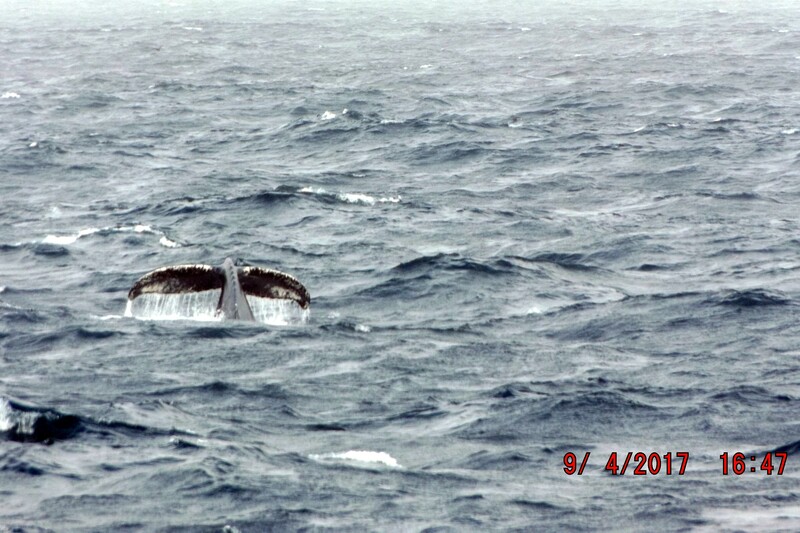 To be honest, that was more exciting than seeing whales. It took about twelve hours for us to reach the first station site. The established routine is bongo net and Stauffer trawl, cruise to next site, bongo net and Stauffer trawl, cruise to next site, bongo net and…well you get the point. 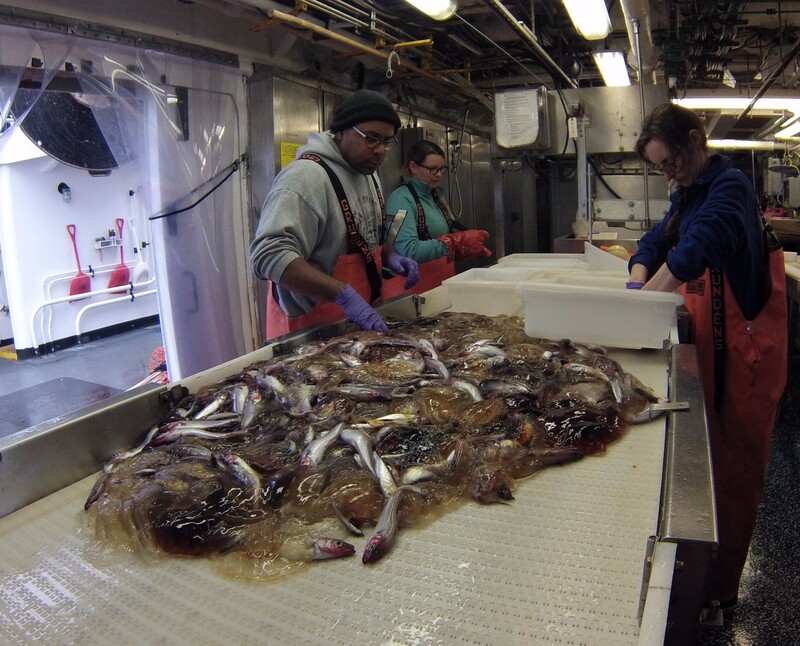 When the Stauffer trawl net is hauled in, the science team and survey tech sort through everything in the net. Juvenile pollock (less than a year old) go into one bin, capelin into another bin, so on and so forth. We caught a cool looking smooth lumpsucker fish. Here I am holding the smooth lumpsucker. 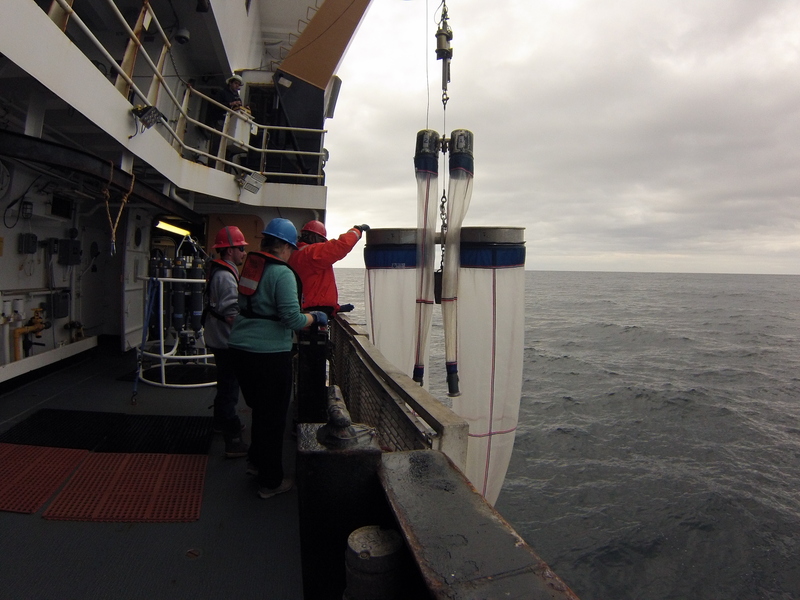 When the crew and science team aren’t working jellyfish laden Stauffer trawls, they’re busy with the bongo nets. These are my favorite because they pull up lots of plankton. The deck crew and survey tech bring in the bongo nets. Most people would totally freak out if they knew how much stuff was swimming around in the water with them, including pteropods, which look a bit like slugs with wings. Pteropods are a type of zooplankton also know as sea butterflies for the small “wings” attached to their bodies. The ones we got today were big enough to be slugs. My goal over the next couple of weeks is to get a decent video of them swimming. Peer pressure is a powerful thing. Even though I’ve never gotten seasick, I succumbed to peer pressure and took some meclizine before leaving the dock. I really didn’t want my memories of the Oscar Dyson to include yakking over the side of the ship. In this case, positive peer pressure was a good thing. I’ve been feeling just fine even when confined in small, fishy smelling rooms. Eau de poisson anybody? The biggest adjustment has been the time change and 12 hour work shift from noon to midnight. I like to describe myself as the oldest, young person alive. We’re talking early bird specials, going to bed early, and waking up at the crack of dawn. So while the day shift I’m on is clearly a perk, it’s still taken me a few days to get used to it, especially since it’s 4 pm to 4 am east coast time. Judging by the 9.5 hours of sleep I got last night, it’ll be smooth sailing from here. I can also report that the food on board is delicious. Ava and Adam crank out tasty options at every meal, and somehow meet the needs of about 35 people some of whom are vegetarian, vegan, low acid, etc. Since Kodiak was a washout, I tagged along on the shopping trip prior to our departure. Five shopping carts later we were ready to eat our way across the Gulf of Alaska! 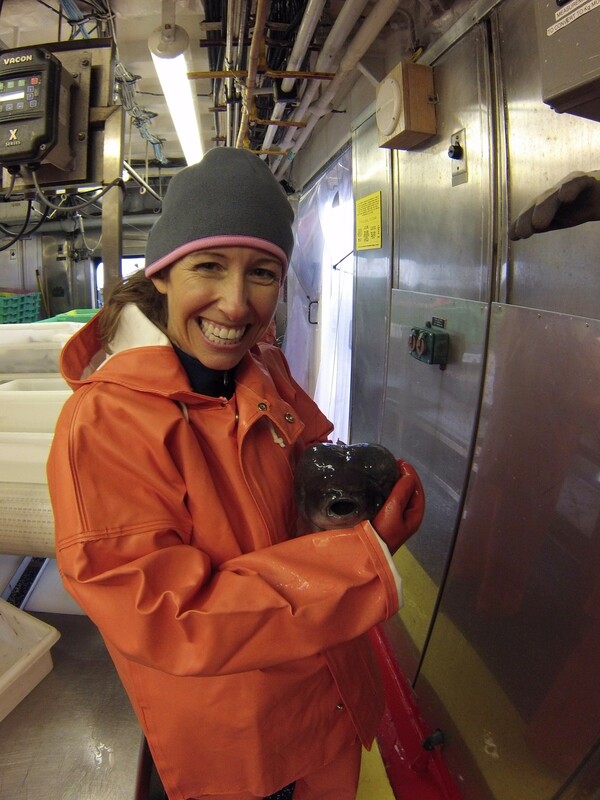 NOAA scientists on board the ship rotate through different at sea research cruises throughout the year. They even participate on cruises that have nothing to do with their actual research. It’s like a big group effort to get the data NOAA needs for its various research projects. 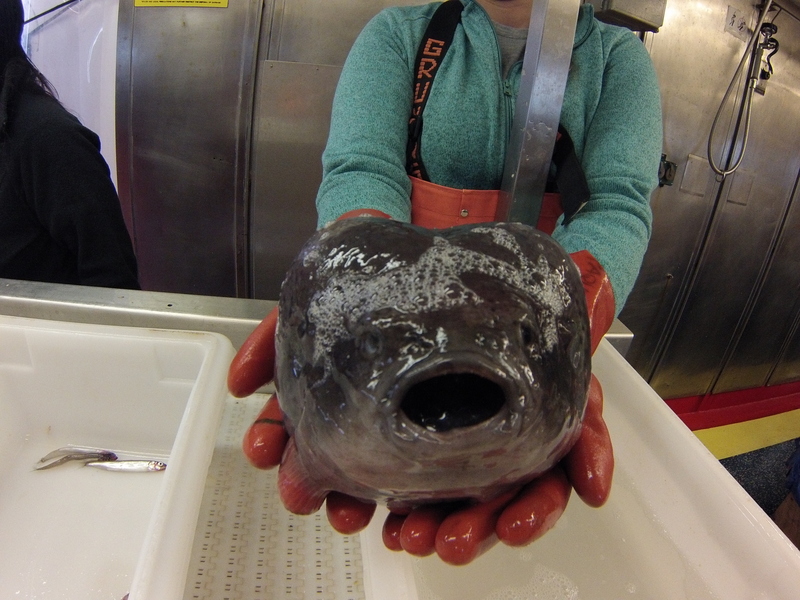 This entry was posted in 2017, Jennifer Smallwood, NOAA Teacher at Sea and tagged jellyfish, lumpsucker, Oscar Dyson, Pollock Survey. Bookmark the permalink.